If you haven’t heard of the term “credit score,” it’s one that you will want to become familiar with during your time as an international student in the US. A credit score is a rating given to your financial background when assessed by a lender. When you’re applying to borrow money (like through a loan or credit card) the lender will most likely look at your credit score to see whether you are an eligible candidate. Your credit score basically sums up how much of a financial risk you would be if you were to be loaned money. Here we’ll share with you what it means to build credit, why you should build credit as an international student and how you can start building your credit as an international student. The most difficult part of credit building is that you do not build just one solid credit score, instead you have several that can change depending on your spending and saving habits. Fair Isaac Corporation created a FICO score, which is the most common measurement used to identify your credit rating inside the US. Although there are competitor rating systems, this is the one you’re most likely to see during your time as an international student. A FICO score is used to predict how reliable of a borrower you will be in terms of paying back the borrowed funds. However, typically if an individual does not have credit history that is at least six months old, they will not have a FICO score. Additionally, different lenders will request your credit score from different sources depending on the system they use and whether they’ve adapted to the new FICO system or use another company such as VantageScore. Payment history refers to the repayments you have made on credit cards and loans in the past. Your credit score will take into consideration the speed and quantity of repayment on all the lines of credit you have taken out in the past to find the average. It will particularly consider late payments, fees and charges due to breach of credit conditions. The amount owed is the quantity of money you still owe on all forms of credit. For example, does your credit card stay maxed out, or are you steadily paying it down. The credit score will also take into consideration how long you have been building credit. If you start building credit responsibly when you are a student it will be reflected positively in your credit score The sooner you start building your credit, the better. The number of recently opened accounts will also be reflected in your credit score. Opening many new accounts in a short period of time might appear irresponsible as you are suggesting that you need many forms of credit to make purchases. Using a few sources of credit wisely is better than having a large number that you can’t keep track of, or that are unnecessary. The different types of credit in your possession will be considered in your score, such as credit cards, loans and store cards. Having different forms of credit and using them responsibly can be beneficial in demonstrating how you manage your money in different areas. However, this is not a vital component as it is more important to manage one or two types of credit wisely than to misuse many. Credit building may not seem like a top priority when you first arrive in the US, but the sooner you start establishing credit the better. In the long run, you will need credit history to prove that you are a reliable borrower. Lenders will need reassurance that you will pay back the money you owe on time each month, and a strong credit score can provide them with the reassurance they need. Without credit history, you won’t be able to do certain things (or will have a difficult time doing them) like buy a house, buy a car, get good rates on home and auto insurance, rent an apartment, have access to low interest rates on loans, etc. There are several reasons you might need to access credit in the future, that might not seem important now, but without credit history it will be impossible to provide evidence of your financial background when required. Without good credit history when applying for a loan or a mortgage, it is likely you will either need to pay an additional fee upfront to secure what you’re trying to obtain, or you will need someone to co-sign with you (usually your co-signer must be a US citizen). Although having a co-signer can help you obtain the funds, it can also complicate the lending process and requires you to rely on the other people involved. Additionally, if you are sensible with your finances, you are losing out by not establishing your credit history that reflects your positive financial behavior. Credit building can be thought of as your resume to lenders. Just as a strong resume will appeal to an employer, a strong credit history will appeal to a lender. Establishing credit during your time in the US is important and there are a number of ways to accomplish this. Read through the various methods that international students like you can start to build credit, then get started today on this process. The sooner you begin to build your credit while inside the US, the better. One of the easiest ways to build credit as a new international student inside the US is with a credit card. Using a credit card responsibly is a simple way to build and maintain a good credit score. Credit cards are now used as widely as (if not more than) cash in the US, making it almost obligatory to own one. Not having a credit card can make it difficult, if not impossible to do certain things like buy things online and rent a car. The best way to build credit with a credit card is to use it for your daily purchases and pay off your charges each month or week. This will allow you to have regular use of the card, and steady payments- both of which lenders like to see. To ensure you never miss a payment (and harm your credit score), create an automatic payment for the minimum due each month. You can then manually pay the difference of what you’ve spent on the card. Although having a credit card during your studies in the US is important, it can be difficult to find a company that will allow you to open a credit card as a new international student- especially if you don’t have a social security number or credit history. 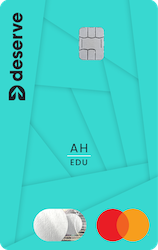 However, it is possible to find companies, like Deserve, that will allow you to open a credit card as an international student. Deserve is a company built by former international students, so they know what students like you need. Students who are at least 18 years old, have been accepted to study at an accredited US college or university, and have a valid F1, J1 or M1 visa are able to apply for a credit card through Deserve. If you don’t think a credit card is for you then you can start building credit directly through a bank with a debit or savings account. You will want to start by seeing if the bank you work with in your home country also has a US branch near you. If not, there are plenty of other options and your university might even have a bank on campus. There are a couple of ways that you can build credit by using a bank account. Try opening both a checking and a saving account. Regularly transferring money to your savings account, or keeping your savings account healthy can show that you are responsible with your finances, and are thinking long-term. Additionally, you can set up direct debit to ensure that your bills and expenses are always paid on time. This is another effective way to demonstrate your financial responsibility, and help keep your credit score strong. To make sure you’re able to manage your bank account and make payments toward your bills as needed, find a bank that makes banking easy. For example, do they offer a mobile app? As an international student you need to make sure you have access to your account information whether you’re across town in class or across the world on vacation. If you are renting a property on your own or with housemates you will have to pay utility bills – gas, electric, phone, internet etc. (this will not apply when using student accommodation but you will need to apply for your own cell phone contract) so why not build credit while doing it? If you’re not paying in one lump sum, set up monthly transfers from your bank toward your rent, expenses and utilities to ensure they are always paid on time. Making regular payments on all your utilities is another way to prove to lenders that you are responsible with your payments and will be a suitable applicant for a loan or credit option. For each of your utility bills you can request proof of your payments over the last months or years, which many credit providers are beginning to accept as supporting evidence of your payment background for your application. Additionally, if you decide to relocate within the US keep in mind that your new utility company may request your utility payment history. If you don’t want to open your own credit card or are finding it difficult to do so, another option is to become an authorized user on a family card. Perhaps you have a sibling who is already studying in the US, if they are responsible with their credit card use this can help your credit score when becoming an authorized user. However, keep in mind that a joint card means joint responsibility. Any credit impact it has (negative or positive) will be shared. Store credit cards are credit cards you’re able to use within that specific store. They often offer you rewards such as discounts and early notifications on promotions. However, just like a credit card, the store will charge you if you don’t make the payments on time. Additionally, although they’re usually easy to be approve for, store credit cards typically do not provide you with a credit limit as high as a traditional credit card can- this means if you make minor purchases and don’t have a very high limit, your borrowed to available credit ratio could hurt your credit. If you need to learn more about getting your finances in order as an international student make sure you check out our financing your education section.